Foster regional prosperity by supporting the competitiveness of its economic and business institutions through providing research on management strategies, actions and tools driving development. Welcome to the Center for Competitiveness at Riga Business School. The Center for Competitiveness is a platform for the business community and RBS to share ideas, information and learnings. 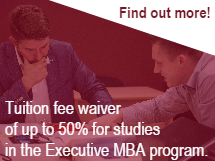 RBS is a community of over 30 faculty and 1100 alumni, most of whom are engaged in business here in Riga or Latvia. RBS has the privilege of hosting excellent guest faculty from some of the best schools in Europe and North America. While they primarily come here to teach our MBA or BBA students, we want our alumni and the broader business community to have a chance to hear them share their research, work or ideas. The Center for Competitiveness will focus on Competitive Advantage for Latvian and Baltic business. Our activities will be targeted at improving existing positions of Competitive Advantage as well as how to attain and grow it. We will work directly with businesses and entrepreneurs who seek to work with us. The data we collect, the analysis we perform and the information we present or make available is for the express purpose of helping market participants plan and execute and evaluate their business strategies and performance. The business tools we teach our students will be on display and available for managers and leaders to use to achieve their business goals. So again, welcome and thank you for taking a look at our website. If we can be of assistance to you, please contact us at the coordinates below.